I love your comparison of a Dungeon to a Spider! I know that as far as I live, I’ll never be able to shake this fitting imagery … not that I would want to! Awesome first entry Salim! I can’t wait to read your future posts! I like the spider comparison. The best Zelda dungeons feel like this IMO, like the Forest Temple and Water Temple from Ocarina of Time. They both have a central room that all the “legs” grow off of. As an aside, yes, I said the Water Temple is a good dungeon. The problem with the Water Temple in OoT is not that it’s badly designed; it’s very well designed. The problem is that the gameplay demands of swapping the Iron Boots on and off constantly were incredibly annoying because you had to go to the equipment subscreen since they weren’t technically an “item” that you could assign to a hot button. They changed this in the 3DS remake, and it makes a huge difference to how enjoyable that dungeon is to play through. But I digress. I would also argue that the best Zelda dungeons also have some kind of central “gimmick” or hook to the design of the place. For example, the Forest Temple has you chasing down the four Poe sisters to relight the torches in the central room. The Water Temple has you changing the water level in the central room to access different areas of the dungeon. Majora’s Mask makes incredible use of this for its limited number of dungeons. The Snowpeak Ruins has you knocking pieces out of the central pillar in order to access different areas (plus this is the “body” of the spider), the Great Bay Temple has the giant turbine in the central room that changes the water flow to block or open certain tunnels (again, spider design), and the Stone Tower Temple flips the entire thing upside down! MM is seriously underrated IMO and has some of the best dungeon design in the entire series. I think the best dungeons all have something like this. The ones that I feel are weakest in the series seem to lack both of these features (I’m reminded of the twilight realm dungeon towards the end of Twilight Princess, blech). My theory on this is that a central mechanical or thematic hook is something that serves to make the dungeon memorable. And the spider design works well because the problem with Zelda dungeons is that they’re inherently linear, but you want the player to feel as if they’re exploring in a non-linear fashion. The basic spider design serves to mask the linearity because of the multiple branching paths. The Twilight Realm dungeon is exactly what you describe as a good dungeon though. There is a central hub and you advance through it by completing each of the legs of the dungeon, which had a theme of “reclaiming light” from each of those legs. The puzzle required to get the light orbs back wasn’t overly hard but still created a sense of urgency. The boss fight there was really fun too, as it incorporated similar concepts to older boss fights without actually making you redo those fights as so many other games have done (A Link to the Past, many Megaman games, etc.). The problem people had with the Water Temple (OoT) was that while having those great design elements, their implementation was sub-par. For example, yes, the water level changing mechanic was there, but if the water was at mid-level and you needed it lowered, you had to first raise it to the max before you could lower it again to the lowest. This added unnecessary tedium and back-tracking. And if you didn’t know this fact, it made the dungeon very cryptic. 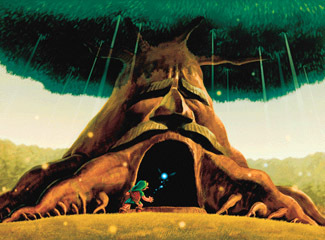 I personally never liked the Forest Temple (OoT) because of another form of tedium that kinda spits in the face of your “different radial spokes coming off of a central room” mechanic: You didn’t do the directions in any particular order, and when you started on one, you’d end up on another through some long passage that connects them, so you didn’t just “finish a spoke and move on to the next”. As a result, finding where your next key you needed was located was a huge, back-tracking ordeal. That dungeon always took me longer than the others just because I had to find a key I was missing. These are some cool insights. I like your spider model! 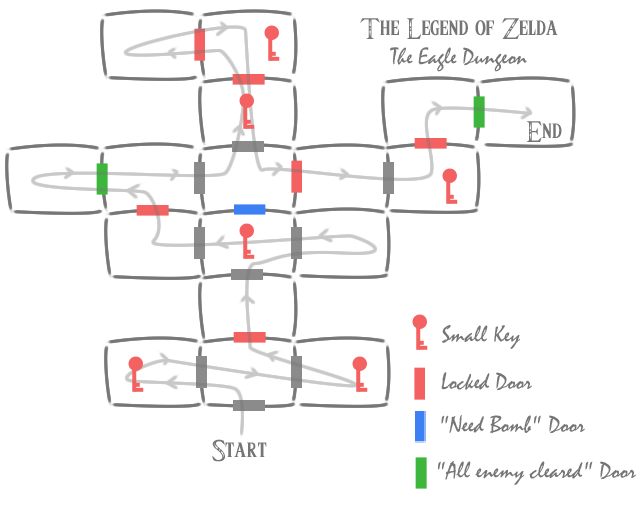 I think the dungeons that work best are generally the ones that force you to visit each legs in a certain order, with a key at the end of each leg like you said, because otherwise you can end up with a lot of backtracking. I also like that you mention the key isn’t always literally a key. I already think of items like the hookshot as a key, like a lot of Zelda players, but you’re right that even those challenging platforming sections are keys in a sense, too. Very interesting post. This makes me want to collaborate with some boffer players and try to create a live action zelda styled boffer game. Adam! I am here right now for that very purpose! I am trying to make a live-action outdoor link puzzle!